The warrior is an important figure in yoga. In the Bhagavad Gita, the warrior Arjuna is taught about yoga, and most importantly the yoga of action. A warrior must act in the face of great challenge. Sometimes, challenge creates doubt, uncertainty, inaction, paralysis - you don’t know what to do - so you freeze. But even that is action - “not to decide, is to decide.” You cannot escape consequences by withdrawing. You must act; non-action is not an option. What are you going to choose to do? Consider what a warrior needs - clarity of purpose, vision, skill and courage - these are qualities that we all need to be successful. The lesson is that our life, our engagement with the world, comes through action, and our success will be determined by the quality of our choices and our skillfulness. The warrior is a figure of action. Be a Warrior. The Warrior sees clearly, and knows what she is fighting for. The Warrior knows what action is required, and is skillful from diligent practice. The Warrior is secure in her footing, centered and calm; focused on the action, not dwelling on the outcome. The Warrior is courageous and compassionate; fierce, not fearful. As a camera needs precise focus and a perfectly clear lens to capture an accurate image, we need a mind that can focus and that is free of the clutter of assumptions and judgements that prevent clear seeing. We all perceive through the lens of our past experiences, likes and dislikes, habits, and assumptions. When these are strong, and we are not aware of how they color our perception, what we see may be more about our accumulated "stuff" and less about the reality of what we are trying to perceive. To see clearly, we need to focus our awareness and clear up our lens of perception - the mental thoughts and patterns that we use to interpret what we take in through our senses. Perhaps our first impression is not the best one. As you observe and seek to understand, what assumptions are you making? Are they valid in this case? Without that assumption, how does my perception change? Do I feel a memory or emotion being triggered? How is that affecting what you think you see? Seeing clearly requires both awareness of the object, and awareness and self-honesty about how our assumptions, emotions and desires affect our seeing. Keep peeling back the layers of your "stuff," bringing more transparency to the lens of your perception. Clear seeing is essential for right action. Yoga gives us tools to increase awareness and to clear and focus the mind. What is your purpose? What is your goal, your intention? Often we’re confused about this, buffeted from all sides with conflicting information and others wanting, or even demanding, that we do this or that. We often rely too much on “thinking” and “analysis” in an attempt to figure this out. While this is useful in helping to see clearly, ultimately you can’t rely on the analysis to tell you what is right for you. Often analysis will veer off into consideration of what is most practical, most safe, or most likely to please other people. Understanding these things is part of seeing clearly – BUT they are not the considerations that tell you what, deep in your heart, you know you need to do - the thing that you can truly be committed to and that will bring your energy and capabilities surging out of you. To be clear in your intention requires that you be in touch with your core values, aware at a deep level of who you are. What gives you true joy? What inspires you? What brings you the sense of awe and wonder? The clarity you seek and the power, resolve and courage you need are already inside you. You can’t get them from another. You don’t find them by searching far and wide. You uncover them through your practice of becoming quiet and listening to yourself. You sit, as quietly as you can, or you go for a walk in the woods, or practice asana - simply and mindfully - and you see what comes up. It may not be what you were expecting. Don’t dismiss it. Be with it, hold it, revisit it in your practice. If it is a truly heartfelt purpose, it will only grow stronger, and then, when the time is right, it will shine with crystalline clarity, and you will Know. Knowing what action to take requires knowledge and understanding of how things work, how people behave; cause and effect. There's a need to see clearly throughout, not to become so attached to the intended result that you overlook important aspects of the action, or that you allow the ends to justify the means. The yoga tradition has a set of five ethical principles (called yama, which means "restraint") that speak to how one relates to others and the world. These are not commandments, they are principles to guide your process of deciding how to act. The first is a principle of non-harming, or protection of others - in speech, thought, and action. The others are honesty, non-stealing, moderation, and freedom from greed. The key is to be thoughtful and clear seeing about your action and its consequences, both positive and negative, and choose actions that are consistent with your values and ethics. Remember the quote from TKV Desikachar (above under "Seeing Clearly"): we want to avoid actions that we will later regret. Knowing what you want to do is of little use if you lack the skill to carry it out. Yoga teaches that diligent, regular practice is necessary. While this certainly applies to external skills such as speaking, writing, organizing, planning, or the skills of any vocation, it is perhaps most important for internal skills: the ability to focus, the ability to stay calm in challenging situations, the ability to not react to words or actions that could "push your buttons," the ability to be compassionate toward angry or unkind people. 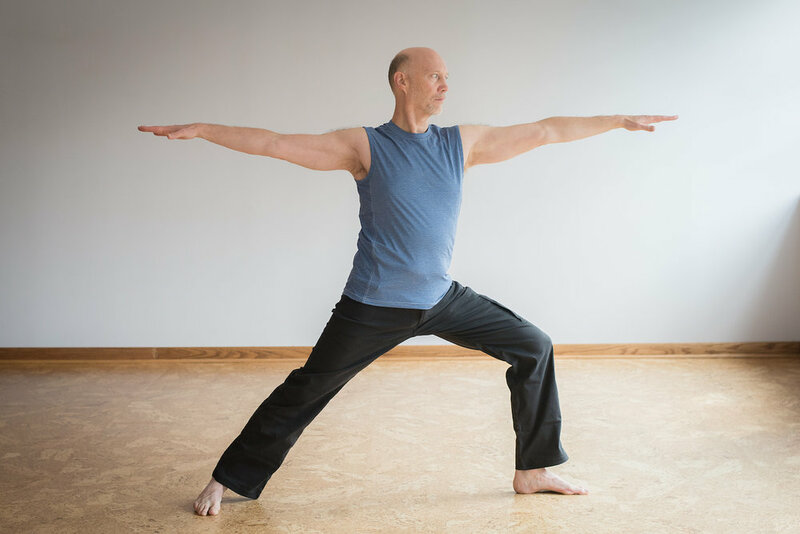 Yoga practices including asana (physical postures), pranayama (breathing techniques) and meditation are powerful tools for this internal practice. It’s very hard to consistently take correct and effective action when your energy is scattered, mind is in chaos, and you feel out of balance and ungrounded. Every yoga pose starts with the foundation, securing the connection between you and the support of the earth. Similarly, it is necessary to be emotionally and mentally grounded and secure, bringing emotions back to a place of love and positive energy, and the mind back to the stillness that we all have within. The ability to find and maintain secure footing, centeredness and calm in the face of challenge, must be practiced. Asana (posture) practice is not really about putting the body into a fancy shape. It is about putting ourselves in a position of some challenge, but not too much, and practicing secure footing, balance, and calmness. As our skills improve through our diligent practice, we can take on greater challenges. This practice prepares us to be secure, centered and calm in all of life. Yoga teaches that our focus needs to be on our action. We do our best, and then accept whatever results. The more clear our vision, knowledge of right action, and skills are, the more likely the result will be what we envisioned, but the truth is that very few things are completely within our control. Our action is what we can control, it’s what we do in the present moment. The outcome is in the future, and it’s a waste of energy and attention to be focused on it. In fact, focusing on the outcome can cause our actions to fail. Imagine that you’re a highwire walker undertaking a challenging walk, where slipping and falling could be fatal. You see clearly - understanding the situation and the risks; you know what action is required; you have diligently practiced. Now it’s the big day. To achieve the outcome, you need to step onto the wire, find secure footing and balance, and then put one foot in front of the other - again, and again. You have to be fully present to your action, step by step. If you let your mind race ahead to the outcome you want, which is to step off on the other side alive, it is more likely that your diminished attention to the present will cause you to fail. Thus, success requires both an intense will to act with skill, and the faith to trust our actions and to let go of the illusion that we control the outcome. Some describe this as offering our actions to the universe. Courage comes from the warrior's confidence in having chosen the right action and having the skill to carry it out, allowing the warrior to face challenge and act with a resoluteness, or fierceness, that is not mean-spirited or intended to cause harm, but stands strong for what is right. Fear, as an emotional response to an imminent threat, is built into us and is important to our survival. But the human mind has the capacity to create and hold onto fear out of imagined threats, and this fearfulness only creates anxiety and prevents us from living fully and joyfully. This fear saps our energy, and is itself a bigger threat to us than the imagined danger, because it keeps us from devoting full attention and energy to actions in the present. Compassion means to "suffer together." The warrior acts with the intent to protect and avoid harming self, others, and the natural world, and shows compassion to all.